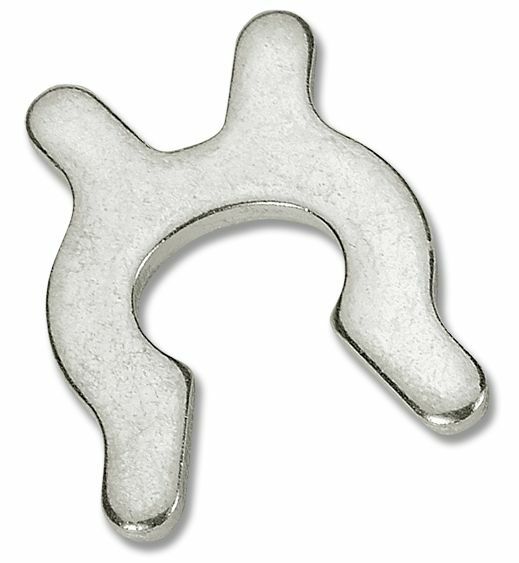 Crimp Ring Retainers (X Washers) are easier to use than a cotter pin! Applied in a groove on shaft or pin, Crimp Ring Retainers are squeezed into place with a pliers. Remove by squeezing the top ears to reopen the ring. Heavy construction in mild steel offers strong retention. No sharp edges and minimum clearances are additional benefits. Also known as X Washers. 5/32“ shaft: use CRR-5 for normal duty applications. Use CRR-6 to provide higher thrust load in heavier-duty applications. 3/16“ shaft: use CRR-6 for normal duty applications. Use CRR-8 to provide higher thrust load in heavier-duty applications. 1/4“ shaft: use CRR-8 for normal duty applications. Use CRR-10 to provide higher thrust load in heavier-duty applications.